Teachers at Lowbrook adopt a differentiated approach to learning to ensure that children of all abilities can grasp new concepts at their own pace. Learning is personalised in order for us to meet all the levels of abilities and needs of our children. A variety of teaching styles are used including whole class teaching, mixed or similar ability groups, small group work and one to one teaching. We also recognise that not all children learn in the same way; we therefore use a wide variety of teaching and learning styles when we teach. Styles could include visual, auditory or kinaesthetic stimulus. The approach chosen will depend on the individual child and the subject being studied to ensure the maximum progress of every child. Lessons are delivered by enthusiastic teachers who bring awe and wonder into the classroom. Music, Art, Dance, Drama, Higher Level Maths, Oracy, PE and ICT. 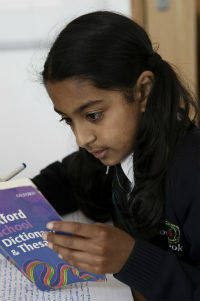 This ensures the children gain the highest quality of teaching across the curriculum. Overall the staff work as a team; collaboratively planning, assessing and strengthening their teaching. All of the staff have 10% release time for preparation, planning and assessment. The school does not have a homework policy as this is not a statutory requirement. Homework is however set by the teachers to support your child's learning and is generally built into your class routine, as described at the Meet the Teacher presentations at the start of the academic year. However, teachers may adjust this according to what they have planned and at times may set no homework at all. Expectations are further explored and outlined within the Home School Agreement.